Light & Darkness Radio: Featured Today! "Sons Of Seasons, Nevermore..."
Sons Of Seasons (DE) - ‘Sons Of Seasons’ was founded in 2007, around January. Up to this point Oliver Palotai has always been an instrumentalist in bands that already existed way before he became a member – for example Kamelot, Doro, CircleIIC ircle, Blaze or Uli Jon Roth. Alongside he worked as songwriter and producer. So what he finally needed was a melting point for all his skills, as player, composer and producer. In January 2007, Oliver Palotai and drummer Daniel Schild were still members of Blaze, the band of Iron Maiden’s former singer Blaze Bayley. Disagreeing with the methods of Blaze’s new management the whole line- up decided to quit. It was the perfect point of time for Oliver not to search for another existing project to participate but to start his own thing, a musical playground without limitations. Based on not always positive experiences of the past Oliver knew that the perfect line- up had to consist out of great musicians, without doubt, but also out of persons being able to work as a team for many upcoming years without tripping over oversized egos. So, the first member besides Oliver was drummer Daniel Schild, joining in Spring 2007, and Jürgen Steinmetz on bass , in the following summer. The biggest challenge for Oliver during the initial songwriting process was to bring all his pass ion for Metal, Jazz and Class ical Music together. Surprisingly, once started, it was easier than he thought it would be. At a quite early point you could already hear & feel how Sons Of Seasons would sound like. Also around summer 2007, the first singer, Tijs Vanneste, was found. Although Tijs proved to be a great musician the bands’ future touring plans didn’t fit the tight working schedule at his job. Still, in some of the songs of the debut album, you will find a couple of songs with parts inspired by his ideas. Oliver met Henning Basse, the new and final vocalist, during a tour in Japan. Amazed by the singers’ outstanding live performance Oliver got in contact with Henning end of 2007 and introduced the song material. Henning immediately saw common musical ground and started adding his ideas to the material. The lyrics reflect mainly Oliver’s interests and pass ions besides music: Literature, history, politics, science and the cultural heritage of every part of the world. That is what Sons Of Seasons is about. The band performed their first concerts in February 2009 in Belgium, the Netherlands and Germany. In June 2009 they already opened the main stage of Metal Camp festival before Ed Guy and Kreator and continued with success ful headliner concerts. October and November 2009 they went on European tour as support of EPICA. While the lyrics might be more delicate, Sons Of Seasons proved to be a well- oiled metal machine on stage. In 2010 the band started the song writing period for “Magnisphyricon”, playing at the same time with bands like Rage, Doro, or Lacrimas Profundere, and at festival like M’Era Luna or Summersend. For the final mix they chose renowned musician and engineer Dennis Ward, who delivered in detail the result they were heading for. 2011 will bring many more live gigs, as a support tour for Kamelot and a co- headliner tour with MaYan is already confirmed. Nevermore (US) - Nevermore started in the beginning of the 1990s, when the band Sanctuary was pressured by its recording label to change its musical style, switching from heavy metal to grunge, which was obtaining mainstream success at the time due to bands such as Nirvana and Pearl Jam (both, incidentally, also from Seattle). Two members of the band — vocalistWarrel Dane and bassist Jim Sheppard — didn't agree with the change, and thus proceeded to create a project of their own: Nevermore. 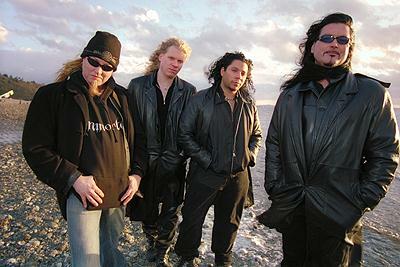 By the end of 1994, the band assumed a stable lineup, which saw the additions of drummer Van Williams and former Sanctuary touring guitarist Jeff Loomis. In 1995 Nevermore released its debut album through Century Media Records. This album received much attention and specialized review, as its release was followed by a European tour with Blind Guardian and a North American tour with Death. Second guitarist Pat O'Brien joined the band prior to the release of the EP In Memory and also took part in the recording of the subsequent album The Politics of Ecstasy, both from 1996. O'Brien left Nevermore to play in Cannibal Corpse and Curran Murphy from Shatter Messiah was enlisted as a touring guitarist for the band until Tim Calvert (who played for the band Forbidden) was able to join the band. Three years without releases followed, but in 1999, the album Dreaming Neon Black was released. Highly acclaimed, the album narrates the story of a man's slow decline into madness, subsequent to the death of the only woman he ever loved. The tracks of this album are varied in style, ranging from slow and melodic to aggressive and progressive. Warrel Dane put much effort in interpretation, emitting varied emotions from his vocals. The album's lyrics are a partially true retelling of the events Dane underwent after the vanishing of his longtime girlfriend. A long tour with several concerts followed, and Nevermore played together with bands such as Mercyful Fate, Arch Enemy, Iced Earth, and Opeth. After the end of the tour, in 2000, guitarist Tim Calvert announced his departure from the band, subsequent to his marriage. Instead of finding a replacement, the band decided to continue as a quartet, only adding session guitarists for live appearances, such as Curran Murphy (who went on to play in Annihilator and form his own band Shatter Messiah) and Jag Panzer's Chris Broderick. Nevermore proceeded to record Dead Heart in a Dead World, which was followed by tours with several bands, most notably with Savatage in 2001. The band's fifth album, Enemies of Reality, remained in production for over a year, and was released in 2003. This album faced much criticism for its production and was re-released in 2005, after being remixed by Andy Sneap. On tour, the band was joined by second lead guitarist Steve Smyth, formerly of Vicious Rumors and Testament; Smyth was eventually added to the line-up on a permanent basis. A sixth album, This Godless Endeavor, was released in July 2005. Nevermore then toured on Dave Mustaine's Gigantour during the summer of 2005. In 2006, they toured with Disturbed and also as direct support to In Flames on the second leg of its North American tour. 2006 held a bit of bad luck for Nevermore, as bassist Jim Sheppard underwent a procedure for Crohn's disease, which he has suffered from for over 15 years, and guitarist Steve Smyth was diagnosed with chronic kidney disease, and had to get a kidney transplant. Warrel Dane had previously developed type 2 diabetes, and the band was forced to cancel their show in Grand Rapids, Michigan, on May 13, 2006, due to an unspecified illness afflicting Dane. On September 12, 2006, Nevermore was supposed to record its first full length DVD live at the Zeche club in Bochum, Germany. This event was to be captured by 7 cameras and the live recording was to be produced by Andy Sneap. However, according to Nevermore's official website, on the day of the show, Warrel Dane fell ill with an infection, eventually resulting in the necessity of seeing a doctor at a hospital in Dortmund, Germany. Doctors insisted that he be kept at the hospital and the show was canceled that evening. Apologetic to their fans, Nevermore agreed with the local venue to perform the show on October 11, 2006. The double DVD set would also include a Nevermore documentary, all of the band's promo videos and past recordings from their 11 year career. The DVD was released on October 20, 2008, and is entitled The Year of the Voyager. On August 30, 2007, it was announced that Steve Smyth would no longer be a member of the band, citing personal and business reasons for the departure. He stated that he would also be touring with Danish metal band Hatesphereas they supported Behemoth and later Dimmu Borgir, and would also be working on the release of The Esseness Project, an all-instrumental progressive rock album. Dane and Loomis entered the studio, each to record a solo album. Dane recorded Praises to the War Machine and Loomis recorded Zero Order Phase, both released in 2008. Later that year, the band released their first ever live concert CD/DVD titled The Year of the Voyager, the only release to feature veteran touring guitarist Chris Broderick, who departed to join Megadeth. In an interview with Komodo Rock published in July, Jeff Loomis said that "I actually have six or seven songs already for the new Nevermore record. I'm about half way there, and we're going to be going into the studio probably some time in the early fall." Nevermore were one of the first bands to be confirmed for Wacken Open Air 2009, where they performed alongside many bands including Motorhead, DragonForce and HammerFall. Nevermore entered the studio in August with producer and Soilwork guitarist Peter Wichers to record their long-awaited 7th album The Obsidian Conspiracy. The recording was completed in October 2009 and was released the 8th of June 2010 in America, and the 31st of May 2010 in the EU On June 1, 2010‎, Nevermore announced a North American Tour in Fall with openers Warbringer, Hatesphere and Blackguard. On April 21 2011, long time and founding members Jeff Loomis and Van Williams announced their departure from Nevermore citing personal and musical differences.